Returning after a sold-out debut event in 2017, Gold Coast’s BEST NIGHT EVER is back with the all-ages mini-fest today completing its already jaw-dropping lineup. 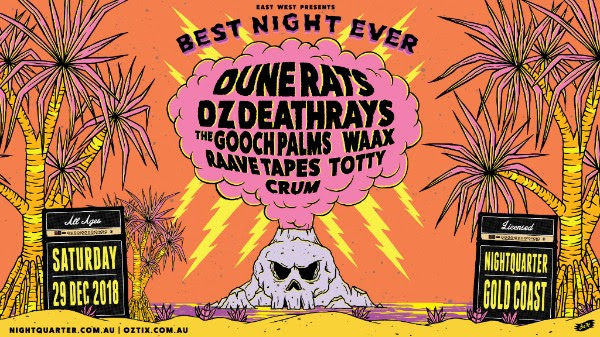 Fan favourites DZ Deathrays, WAAX and RAAVE TAPES join headliners and fellow Brisbane powerhouse Dune Rats alongside The Gooch Palms, Totty and Crum for an evening rager at NightQuarter on Saturday 29 December. For eager little groms, the event is ALL AGES, with minors permitted with a legal guardian over the age of 25. Plus, forget spending that Christmas money from Grandma on expensive taxis, public transport to and from the event is absolutely free. Punters only need to show their Oztix event ticket for a free ride on Queensland Rail City Network services, Surfside Buslines and G:Link light rail services. Final release tickets are on sale now via Oztix and selling fast. Cure that hankering for loud and loose garage punk rock before the year ends, BEST NIGHT EVER is the ultimate way to farewell the last few days of 2018.